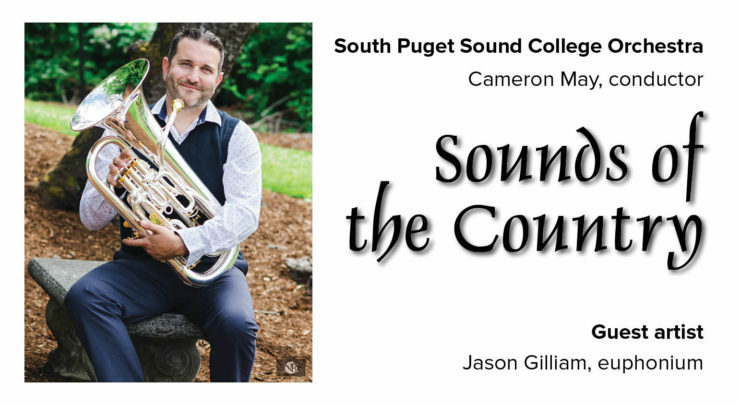 The South Puget Sound College Orchestra closes its 2018-19 season with musical depictions of the countryside with “Sounds of the Country”. The evening begins with Rossini’s Overture to The Thieving Magpie. Euphonium soloist Jason Gilliam is then featured with the orchestra on James Curnow’s Symphonic Variants. In the second half, the orchestra presents Vaughan Williams’ English Folk Song Suite and Sea Songs and rounds out the night and season with Johann Strauss II’s Tales from the Vienna Woods. The orchestra is conducted by Cameron May. The featured guest is Jason Gilliam, euphonium. Join us on Saturday, June 8, 2019, at 7:30 p.m. at the Kenneth J. Minnaert Center for the Arts Main Stage.